I’ve been horrible with updating, haven’t I? I moved to Miami and time flew, but I’m ready to review some books again! 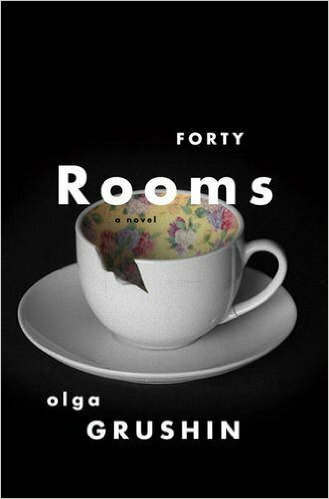 I just finished a new book that came out in the beginning of the year called the Forty Rooms by Olga Grushin. It’s only May, but this is my favorite new book so far this year, so let’s jump right into it. Where to start? This is a small book with a lot packed into it. I bookmarked almost every page, because there are sections that I simply cannot help quoting and reading over and over again. Forty Rooms is about the life of a Russian woman who is unnamed until halfway through the book where she is only known by her married name, Mrs. Caldwell. The book is divided into five sections – Mythology, Past Present, The Past, The Present and finally, The Future, which has nothing. In the beginning of each section are crude illustrations of the various rooms that this protagonist inhabits where the character makes a decision or has a revelation that moves her into the next section of her life. She inhabits forty rooms throughout her life that categorize the stages of her life, whether that be daughter, college student, heartbroken 20-year old, married woman, mother, or ghost. The first part, Mythology, unfolds in her childhood apartment in Moscow where she is a little girl growing up with her intellectual parents and her grandmother, who regale her with mystical tales. The protagonist, who remains unnamed, speaks in the first person about her family and the stories and knowledge they impart on her. Whether it is the mermaid, who is her mother, who tells her the story behind each piece of jewelry in her jewelry box. Imparting on her the importance of history and one’s secrets. Then there is her father, a college professor, who gives her weekly lessons on philosophy and various cities in the world. In this very same section, she also meets her imaginary friend and sarcastic muse, whom she affectionately and bitterly calls Apollo. He appears once she stumbles upon some illegal poetry (everything was illegal in Soviet Union at some point…) that is in her apartment when her parents are having a party and she is supposed to be asleep. This poetry and the sudden appearance of Apollo awaken her desire to become a poet. And thus we begin the journey into the mind of a girl who wants to attain immortality through the written word and her assertion that she cannot attain this goal by living an ordinary life. If one wants an extraordinary life, one must leave behind the noti ons of the past and a normal life of domesticity. After this revelation, the young girl becomes a teenager. She’s in her dacha with her best friend Olga and declares, “I would like to go to other places, new places. Strange places. Not to have a house anywhere, but just travel from place to place, smell it, taste it, describe it, remember it all, then move on..” It is there that she foreshadows this longing to travel and write, however, she also foreshadows her glee at being alone without companionship as her best friend Olga leaves her to go flirt with the next door neighbor. The second part, Past Present, The young girl, now a teenager, decides to leave what she considers a predictable and easy life in the Soviet Union, for an unpredictable, hard and new life in America along with her best friend, Olga. What happens next are the typical college indulges and parties. There’s the reading of one of her poems to her first lover, the learning of a new language other than her native tongue, and then of course, to the symbolic burning of her poems in order to give a sacrifice to the gods. And isn’t that something? Burning a pile of poems that mean the world to you in hopes that it will ensure something greater in return? I immediately think of Anna Akhmatova, the famous female poet during Stalin’s regime, who had to burn her poems after she memorized and recited them to trusted friends. Her poems were burned out of necessity to protect herself and her friends, meanwhile this unnamed teenager burns her poems in hopes of appeasing the gods and in order to purge herself of mediocrity to become a better poet. It made me immediately wonder if the Soviet Union was in fact, a predictable, easy and boring life, considering all the trials and tribulations that Russian writers and poets had to go through in order to even practice their art. I’m thinking of Boris Pasternak, who wasn’t allowed to publish Dr. Zhivago in the USSR and then had to decline the Nobel Prize for said novel. They didn’t have to burn something in order to have a hard life, they just had a hard life, and the life that the teenager has is one of comfort and indulgences. This is solidified in my opinion, because the reward for the burning of the poems is not inspiration, but rather a handsome young man, Adam, walking into her dorm room and the beginning of a new romance. This new romance leads to the protagonist’s first heartbreak! The protagonist sternly states that she loves him more than he loves her and decides not to go to Paris with him. Her lover is also an artist – a musician and unlike her, puts his music first and everything else second. Now she is alone in a dingy apartment with no money and no prospects but a broken heart and a mangled dream. And thus begins a life she never originally wanted, a life of domesticity dominated by the wishes of other people. The need to get married and wear a wedding dress from Paul’s family heirlooms, because tradition. The need to get pregnant as soon as possible, because her father is ill. The need to get pregnant again to appease her mother who believes that no child should be an only child – as the protagonist is an only child, and lord knows she’s too imaginative and in her head, which will make it harder for her to be happier in life later on. And this quote, this discovery alone one night, is what takes the protagonist from first person narration, then “she” and “her” to finally her married name, Mrs. Caldwell. This is where all of her dreams are squashed as she makes her home her absolute world. She never leaves the eventual mini mansion that she moves into with Paul and her two children. Instead, she creates mental lists of the things she wants to do – learn to drive to leave the house, write down poetry, travel the world, find real love – but never fulfills said goals, and instead, roams around her house through all the rooms that become her fragmented life. I don’t want to give away the rest of the book, although there isn’t much to give away. This is the beautifully mundane and tragic story of a woman who gives up her immortality in order to settle into a life that revolves around other people and the upkeep of a large house, in which she acquires many things that mean nothing to her. Every day, every room, every year represents another time when she can dream about a future where she will travel and where she will write, but much like the section of the book, The Future, its blank because when you live a life where things are always pushed back, they never happen. There’s a bunch of questions that are left unanswered in this book, what does it take to be an artist? Can family and art coexist? What does it mean to have dreams? What happens when you don’t fulfill your dreams? Is a life without professional or artistic success still a valuable life? I often think of stories or books written by the sons and daughters of writers and their contempt for their parents at spending too much time on their art instead of with their family. The one vivid image that comes to my mind is J.M. Coetzee’s Elizabeth Costello. There is a scene in the book where the famous writer, Elizabeth Costello’s son recalls being young and waiting outside of his mother’s room. He waits for her all day but she doesn’t come out. Unfortunately, or fortunately, I suppose for the protagonist’s children, this book does not have the same scene that Elizabeth Costello has, instead the main character does not fulfill her lifelong dream of becoming an unconventional poet that travels the world. Instead she never leaves her house. She has children as her ghost of a grandmother so mockingly says, “stoppers you can wedge in whenever your life springs a leak.” A mother of six and is the wife of a man she settled for who no longer loves her, but she cannot leave him. But, Mrs. Caldwell is not the only one who has failed dreams. There are also glimpses into the failed dreams of the people surrounding the protagonist. Her father who never travelled the world, but talks about the world as if reading was the same thing as experiencing the real thing. Her mother’s bundle of short stories that were stuck with her daughter’s college poems, never to be read by anyone else and in a language that none of her grandchildren will ever translate. And then finally, her husband’s dream to become a chef that cooks magnificent dinners for guests without a menu, but instead he begrudgedly trudges to his financially secure job in order to support his stay at home wife and six children. Everyone in this book and in turn, everyone who experiences life also experiences failure and unfulfilled dreams. Something funny thing to note, the best friend of Mrs. Caldwell, Olga, does make her dreams come true. She travels the world. She writes novels. She does everything Mrs. Caldwell dreams of doing, but at the same time, borrows the childhood of Mrs. Caldwell in order to express herself. She essentially steals the memories of Mrs. Caldwell in order to create art, which is funny because Olga is also the name of the author, who is literally taking Mrs. Caldwell’s life and turning it into the novel we are reading. Another fun thing to note, at the end of the book in the Acknowledgements section, the author acknowledges a thanks to her family, specifically her children who “helped with designing the sketches” and “made a sign – “Do not disturb, I need time” – for my office door, the both of them tolerated their share of Chinese takeout dinners and pizza deliveries while I was busy describing the culinary accomplishments of Mrs. Caldwell.” So, even within this novel there is the fact that an author had to sacrifice her time in order to accomplish her art, something her character could not do. Something else I’d like to touch on is the issue of communication. Mrs. Caldwell learns at some point to care about others and put her needs aside, but in the process she also closes her mind to others. She never tells her husband all of her dreams and wants and in return her husband never tells her his desires and wants. The divide in their relationship, and let’s face it, there was always a divide from the moment the two are in Paul’s apartment and the protagonist realizes that she can be with him in order to gain more time, is never made whole because the two cannot just, talk to each other. There is one chapter in which the two seemingly have a drunken conversation, but it could either be real or fake at this point. We don’t know anymore and at this point in their lives, does it matter? Also, within this book is the idea of memory of your past and history. One of the things I’m the most fond of regarding Russian literature is the constant reference to older Russian literature, history and myth. This a very Russian facet in Russian literature and it continually pops up in the book, how Mrs. Caldwell has abandoned her country and past. Something her mother constantly berates her for, because without our past, how can we move forward? So, would I recommend this book? Of course! It’s very small and again, very compact and it really makes you want to take control in your life to assess what is missing and what could be fixed. Mrs. Caldwell’s life is not a tragedy, but at the same time, don’t we all want to avoid harboring resentment for the things we never did? There’s a reason why the expression you regret the things you never did, not the things you did is still around.